What does it mean to trust God in a world that often seems unpredictable and chaotic? How does our trust in God lead us to act and interact differently in the world? Where do we find God at work, and how do we participate in God's ongoing work of peace and mercy? These are just a few of the questions Lakeside's youth will explore this year. Guided by Proverbs 3:5-6 and the quote by Mary Lyons, "Trust in God and do something," we will discover what scripture says about the trustworthiness of God and learn to listen for the ways God is calling us to respond in faith. Lakeside's Youth Ministry is a vital part of the life of our congregation which seeks to involve youth in every aspect of our church's overall ministry. Designed for young people in grades 6 through 12, the youth program offers activities for spiritual formation, education, service, and fellowship that will equip young people for deepening their relationships with God and others, handling life situations and decision-making, and making a difference in their community and the world. *Sunday School classes are offered Sunday mornings throughout the year beginning at 9:45 a.m. each week. These classes explore Scripture in creative and engaging ways to encourage youth to apply biblical principles to their daily lives. 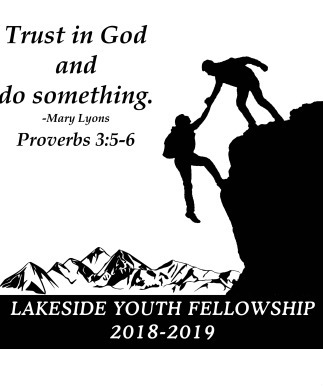 *Lakeside Youth Fellowship (LYF) is our Sunday night youth program which meets each week, September through May. Youth participate in a variety of Bible studies, recreation, missions and creative activities to help them grow in their faith and to foster friendships within the group. LYF is led by the Associate Minister with assistance from youth Sunday School teachers and members of the Youth Committee. *One Sunday night each month, following LYF, we go out for ice cream, donuts or coffee for an informal time of food, fellowship, and fun which allows us to deepend our relationships with one another. Everyone is invited. Bring a few dollars for a snack and let us know if you need a ride home. *Through regular participation in Sunday School, SNL, and group fund-raising activities, youth may participate in summer trips which incorporate the themes from the Journey to Adulthood curriculum. Recent trips include Anchorage, New York, San Francisco, Seattle, Boston, and Richmond. *One of the hallmarks of Lakeside's youth ministry is Gatekeepers Workcamp. Held for one week each July, our congregation hosts a workcamp for approximately 120 youth and 50 adult volunteers from area churches. Volunteers provide home rehabilitation and repairs for elderly and disabled homeowners in the Rocky Mount community. This year, 2012 will be the twenty-first year of Gatekeepers Workcamp. Click here for more information about Gatekeepers Workcamp. *Youth are encouraged to become involved in a variety of other projects and activities within and beyond our congregation. The youth host an annual Valentine Banquet for our senior adults, assist with Vacation Bible School, the Easter Egg Hunt and Fall Festival for our children, and serve as members of various committees of the church. The group also attends an annual ski retreat, participates in an annual spiritual formation retreat, volunteers with various local charities, and holds several recreational and fellowship events throughout the year.